This is a map of the two hemispheres of the world. 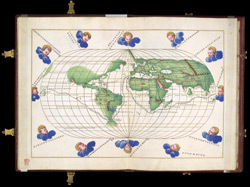 It is from a bound atlas of portolan charts dating from around 1540, the work of Battista Agnese, a chart maker from Genoa, who prepared many portolan Atlases in the 16th century. Invented by mariners, Portolan charts take their name from the Italian ‘Portolano’, meaning a written description of Catalan and Italian ports along a coastline. The first portolan Charts date from the late 13th century and represent an important change in the use of maps and charts. Until this point, most maps had held a religious significance and purpose, such as the medieval mappa mundi which was based on theological beliefs. The portolan chart contrasts with this tradition as they are based on direct observation and first hand experience and have a practical purpose. Here the hemispheres have been graduated for longitude and latitude. The British Isles are shown with England and Scotland as one elongated un-detailed landmass and Ireland as an egg shaped island. Typically for a map of this date the Bay of Cardigan is omitted. The Bay of Cardigan was first accurately depicted in printed form by Gerard Mercator in 1564. As with many depictions from the 16th century the south coast of England is the most accurately presented, due to its position in trading routes.